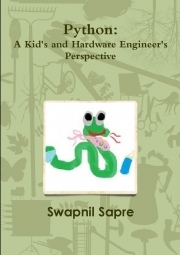 This book explains my experiences in learning Python and implementing the same .And this topic-“Python: A Kids and Hardware Engineer’s Perspective “- because not many books are targeted for this audience for the language in which I think is the easiest path to make your dreams into reality. Python must be the ideal choice for removing the hesitation to get into coding and make your hands dirty-this is the feeling which haunts both hardware engineers and kids equally for a programming language. Swapnil Sapre has over a decade of verification and validation experience for System Design, ASIC/SOC and IPs. He has been exposed to various verification and validation techniques and methodologies like Formal Verification, Assertion Based Verifica-tion, Constraint Driven Random based and Coverage Driven Verification, VMM,URM,AVM and OVM i.e. Open Verification Methodology. Swapnil has been involved with product based organization , through his expertise in - System Verilog, Verilog, and VHDL ,ASIC-SOC-FPGA, Memory, Peripheral verification and System Validation. Swapnil has worked on the domains like Serial Interface, Wireless, SoC, Avionics and- Processor. Apart from Chip design aspect -Swapnil also work and consults on System Design -Integration, Debuggers, Tools, Scripts, Oscilloscopes, Software Drivers, Linux, DLLs , Applications and Firmware and ROM development. Swapnil has received recognition from Respected President Of India for his presentation on “Education-Reengineered”, that was a thought paper presentation to uplift the education curriculum, methodology and process for imparting engineers in country under University systems.